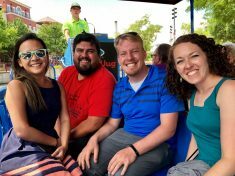 When I visited a few months ago, I had the opportunity to explore the Pueblo Riverwalk and learn a little bit about the history of Pueblo while riding in one of the Riverwalk boats. During our short ride, the guide regaled us with stories about The Great Flood of 1921, the Veteran’s Bridge, and Zebulon Pike’s expedition to Colorado. Although most of what I learned that day was new information, I knew that much of the city’s history had been glossed over. Since Center for Health Progress began organizing in Pueblo in 2017, I’ve learned about another side of the history of Pueblo. The history that I’ve come to know consists of ethnic and cultural diversity, labor strikes, and Chicano activism. For the majority of its existence, industry in Pueblo revolved around the Colorado Fuel and Iron (CF&I) Steel Mill. For nearly a century, the CF&I Mill was the largest employer in the state of Colorado, and in the early 20th century, it attracted a large number of immigrant laborers. Because Pueblo was one of the most ethnically and culturally diverse cities in Colorado and in the West, it became known as the “Melting Pot of the West.” At one point, more than 40 languages were spoken in the steel mill, and more than two dozen foreign language newspapers were published. Several times, workers affiliated with CF&I organized to demand better working conditions and union representation. In 1914, many striking miners living near Pueblo were killed by the National Guard in the Ludlow Massacre. More recently, in 1997, the local steelworkers union voted to strike over alleged unfair labor practices. The strike lasted for seven years until a judge ruled that the 1,000 striking workers should be given their jobs back and that the workers should receive back pay for every day of work they missed since the beginning of the strike. In addition to its long history of labor organizing, Pueblo was a focal point of El Movimiento of Colorado in the 1970s. El Movimiento, or The Movement, was led by Chicano activists who fought for civil rights, representation, and political power though education, culture, and the arts. Activists formed a local newspaper called La Cucaracha, which served to educate Chicanos about topics of the times. Vicente Martinez Ortega is our Pueblo community organizer, and his parents were heavily involved in this work, running La Clinica del Calle, a chain of nonprofit medical clinics that provided health care to people with low incomes and migrant workers in Eastern Colorado. Much more of the history of El Movimiento has been captured in an exhibit at Pueblo Community College. Today, in our movement for health equity, we are using many of the same community organizing tactics as the folks who came before us. We are also working toward many of the same goals—access to health care, good jobs, representation for people of color and immigrants, and for systems of power to be held accountable to the people. It’s an honor to follow in the footsteps of the activists and leaders who blazed the trail and to continue the legacy of community organizing in Pueblo. One day, we hope to add our contribution to the history of Pueblo: a history of adversity, triumph, and resilience that shouldn’t be glossed over when its told.